Healthcare insurance official Tim Vines told Samford University graduates they should "rejoice" in their accomplishment and strive to make a difference in the world. "Rejoice to celebrate where you are," Vines said in an address that lasted about six minutes, "but remember the sacrifice of others that helped you get there." Vines (left), chief administrative officer of Blue Cross Blue Shield of Alabama, addressed a fall graduating class of 250 in Wright Center at Samford. About 1,800 attended the Saturday morning ceremony. "Which is the greatest among you?" Vines asked the graduates. "The greatest among you shall be your servant." 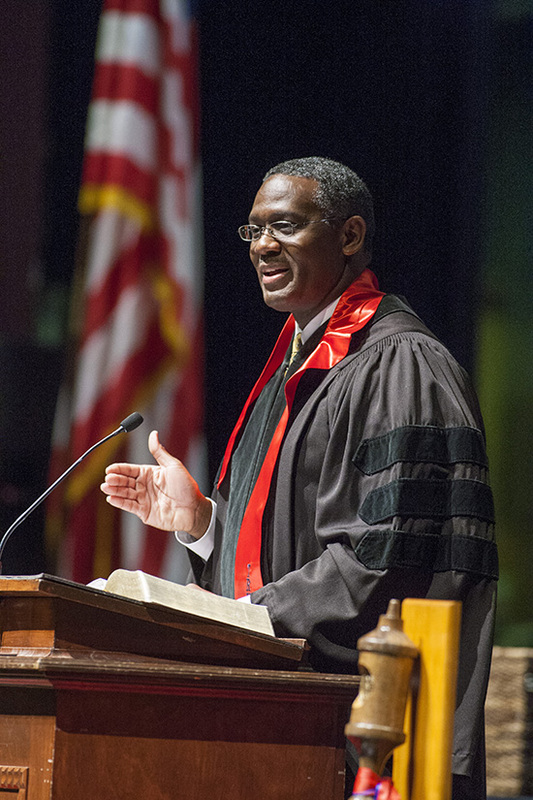 The speaker encouraged the graduates to "resist the temptation to complain," but rather to "go out and make a difference" by working for change. "My encouragement is that you will be a blessing to others," he said. "Be just, be merciful, be humble." Vines, a member of the Samford board of trustees, asked the graduates to stress "honesty, integrity and uprightness" in their lives. He challenged them to, "Be the best that you can be." Samford President Andrew Westmoreland recognized two members of the class who Friday were commissioned as second lieutenants in the U.S. Air Force through Samford's AFROTC program: Diana Kathleen Hudson and Jaime Lee Richter. The students received a rousing ovation.